Place 1/2 inch cubed, sweet potatoes in a large bowl and drizzle with olive oil. Bake 15 minutes. Flip over and bake another 15 to 20 minutes. That’s it. Simple and Delicious. You can use as a side dish or add to your salad throughout the week. I love putting on my green salads! Quick, favorite dip for this family! Simple and Delicious!! In medium bowl, mix refried beans and taco seasoning mix. Spread mixture on 12′ round serving platter. In another medium bowl, mix cream cheese and chiles. Carefully spread over bean mixture. Top with salsa, lettuce, cheese, olives and tomato. Refrigerate until serving time. Serve with tortilla chips. Always trying to find a way to make weeknight meals simple and delicious. If you stop by your local grocery store or Costco (that’s my stop) you can grab a roasted chicken. Use a portion for this recipe and the rest for sandwiches, chicken salad or chicken tacos (just a few suggestions). Also, always a little for our pup, Rooney. Heat oven to 350 degrees. Spray bottom and sides of 13×9 inch glass baking dish with cooking spray. Cook and drain egg noodles as directed on package. In 12 inch nonstick skillet, melt 2 tablespoons of the butter over medium high heat. Cook celery, onions, carrots and garlic in butter until vegetables are tender. 5-8 minutes. Add 2/12 cups of the chicken broth, thyme, salt and pepper to skillet; heat to boiling. In small measuring cup, beat remaining 1/2 cup broth and the flour with whisk. Stir into hot chicken broth mixture in skillet. Simmer and stir 1-2 minutes or until mixture thickens slightly. Remove from heat; stir in shredded chicken and cream. Add cooked noodles to baking dish; stir in chicken mixture until mixed well. Cover, bake 30 minutes or until casserole heated through. Remove from heat, stir in parmesan cheese. Sprinkle over baked casserole. 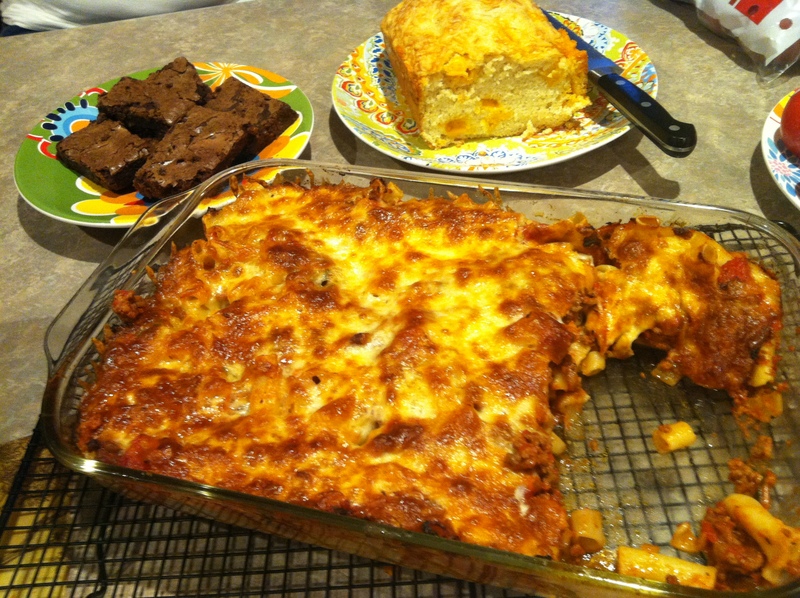 Here is how simple Baked Ziti is to whip up! 1. Fry ground beef in medium to large pot. When browned, remove from pot and set aside. 2. Add 2 Tablespoons of olive oil to pot. Add diced onions or shallots, saute until opaque. Add garlic and saute about 1 minute. 3. Add crushed and diced tomatoes, brown sugar, parmesan, salt, oregano, thyme. 5. While the sauce is simmering, boil a large pot of water for the pasta. Don’t forget to add salt to the pasta water. I add 1-2 Tablespoons of salt. 6. When pasta is done (don’t overcook! ), drain and set aside. 7. Spray casserole dish with vegetable spray. (I use a 9×13 casserole dish) Add a ladle or two of sauce in the casserole dish. Enjoy this simple and delicious meal!